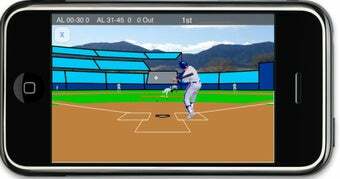 Earl Weaver Baseball, the heavyweight of baseball simulations in the late 1980s and one of the titles that helped create EA Sports, is being ported to the iPhone by its original programmer. It won't be called Earl Weaver Baseball, as he'd need to be paid for his name, and this is probably a $4.99 iPhone game, after all. But Eddie Dombrower does own the game's engine, and in an interview with GameStooge, he said EWB Baseball is already under development. For the first release, I intend to leave them pretty much as you see them in the screen shots. If time allows for the initial release, I'll begin to add texture mapping to fill in the stands, improve the look of the grass and dirt. The animations are, in my opinion, strong enough for the resolution of this device. If the game makes Dombrower enough money, he has plans for a second phase that ramps up the stadium graphics and game camera shot selection. But the first release allows the player to manipulate an entire league in a single commissioner mode, and Dombrower has plans for two head-to-head modes with another iPhone EWB Baseball gamer. Earl Weaver Baseball was a widely acclaimed game - making Computer Gaming World's Top 25 of all-time in 1996, and the hall of fame in two other publications. For seamheads who ride the train or fly frequently, I could definitely see this as a strong buy. But Dombrower would have to pool them with nostalgia buffs and casual fans to get the project to that second phase he's already envisioning. For those who have no clue who Earl Weaver is or why he's important, this clip (very NSFW for language) should tell you everything you need to know about the Hall of Fame manager for the Baltimore Orioles. A delight for baseball fans and non-fans alike.